Is ATP Synthase a channel or an enzymatic protein? Today in a biology lecture about plasma membranes and functions of proteins, we learned about channel and enzymatic proteins along other kinds of proteins. ATP synthase is considered an enzyme that synthesizes ATP, but it also creates a channel for H+ ions to pass through into a lower concentration area. My question is could ATP synthase be considered a channel protein as well as enzymatic protein? Or no since the ion channeling is part of the enzymatic reaction? Also are there more examples were some proteins could have more than one kind of protein to them? ATP synthase is an enzyme, a molecular motor, and an ion channel all wrapped together in one structure (Fig. 1). It is an enzyme, because it generates ATP. It is a molecular motor, because the central rotor part turns about 150 times every second during ATP synthesis (Source: MRC mitochondrial Biology Unit). It is an ion channel, because it funnels protons into the mitochondrion during ATP generation (Source: Davidson College). ATP synthase is composed of two subunits, F0 and F1. The 0 subunit is embedded in the inner membrane, and the other, containing the catalytic parts, protrudes into the matrix. F0 contains the proton channel and is connected to F1 with a stalk. F1 consists of five polypeptide chains, alpha (a), beta (b), gamma (g), delta (d), and epsilon (e). The alpha and beta chains make up the bulk of F1 and are arranged in a hexameric ring. Both chains bind nucleotides, but only beta participates in catalysis (Source: ACE Biochemistry). Another example of complex proteins are G-protein coupled receptors, for example those linked to ion channels (Fig. 2). Here, a receptor is bound to a G-protein, that becomes activated after receptor binding. 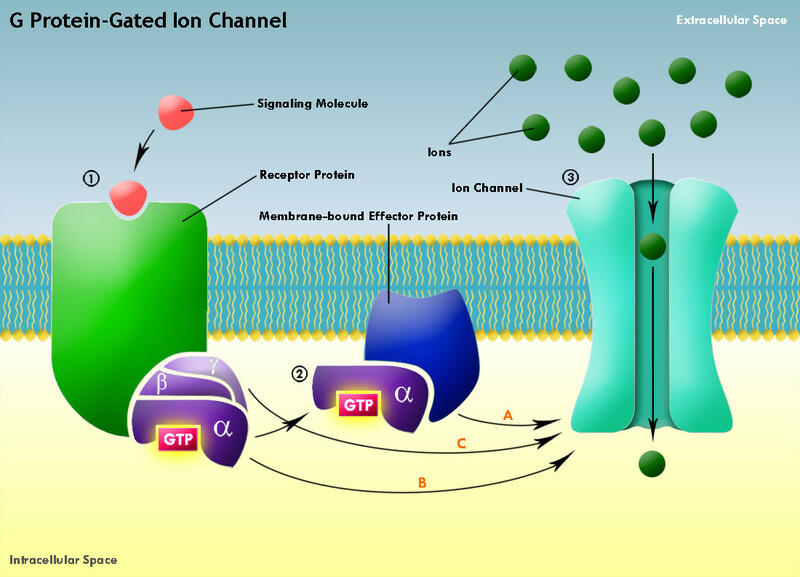 The G protein then leaves the receptor and travels to an ion channel and activates it (or inhibits it). Does osmosis require a protein channel?